We have thousands of properties for sale all over France. But we've no property for sale in Estagel at the moment. And that's something we want to change. If you have a property to sell in Estagel (or nearby) then act now to get a 50% discount. Just place your advert in the normal way (Click here to place your advert). Then send us an email quoting "Estagel" and telling us that you you saw this offer. The village of Estagel, in southern France, is surrounded by some of the most beautiful and spectacular landscapes in the country. Close to the mountains of the eastern Pyrénées, the village is surrounded by vineyards which climb the steep slopes and soak up the warm southern sunshine to produce the delicious and distinctive red wines for which the region is known. Nearby there are dramatic gorges and canyons, with tiny winding roads from which you can gaze down onto the sharpest of drops and the most breathtaking of views. Estagel itself is unassuming and attractive, with old stone houses forming a tranquil and timeless grouping around a central square. The centre of the village has a square within which stands a statue of Francois Arago, Estagel's most famous son. A physicist and astronomer, Arago was the minister for war and the Navy in 1848. Around this area are found a good selection of shops, with the usual baker, butcher, grocers and wine shops. Estagel also has a couple of small supermarkets, so most everyday needs are catered for here. There is a petrol station too which can be handy, but be aware that it closes at lunch-time, which in this part of France extends from twelve until two! 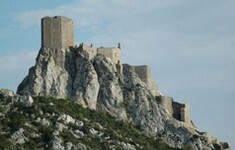 Estagel also has some small bars and a hotel, and is within easy reach of larger towns such as Perpignan. The village of Estagel is located in an area of incredible natural splendour and diversity, and consequently offers superb opportunities to sportsmen. The spectacular gorges, notably the Gorges de Galamus and the Gorges de St Georges, invite you to try the exciting sports of canyoning, caving, rock climbing, kayaking and white water rafting, and the mountains offer excellent skiing and other snow sports in winter. Walkers will adore the amazing scenery, and horse riders and cyclists too will find something very special to enjoy here. Fishermen can obtain a licence at the local Tabac to fish the well stocked rivers, and the village is equipped with a swimming pool and tennis courts for those who need to work off a little spare energy. 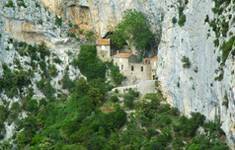 The village is situated in the heart of Cathar country, and lovers of the many myths and legends surrounding this will find plenty to discover and investigate in the immediate area. There is the castle of Queribus, eerily etched against the skyline, or the mysterious Rennes les Château, with all its Da Vinci Code and Grail myth implications. History lives on in this area, and is evident in the remains of the ruined castles, in the surviving buildings, and in the hearts and minds of the people. To get to Estagel from the UK you can take a plane to Perpignan, which offers flights with Ryanair, flybe or bmibaby. It is also possible to fly to Carcassonne, Montpellier, Toulouse or Girona, although these are all a little farther away. Train travel is possible through a link from the TGV at Narbonne to a train taking you to Perpignan. Property in the Pyrénées-Orientales as a whole tends to be expensive, but certain areas are less so, and fortunately, Estagel is in one of these. Estagel offers a chance to make a good investment if you buy wisely, and property here carries a good rental potential too, as the area is handy for the airport at Perpignan, and is close to many major tourist attractions such as the mountains and the Mediterranean Sea. Do you know Estagel better than we do? Do you have photos of Estagel? Estagel lies in the south of France, in the north of the Pyrénées-Orientales department, yet not far from the border with Spain. Access: By air: The nearest airport is Perpignan, which offers direct flights to and from the UK with Ryanair, bmibaby and flybe. By rail: From the Eurostar you can take a TGV from Paris to Montpellier, then a train to Perpignan. Economy: The economy is based on agriculture, with wine and olive oil of importance. Interesting fact: The village makes an ideal base for those interested in the Cathar history and the Grail myths (Da Vinci code etc), as it is set in the midst of this heritage.